A Shaving Shop Sketch. Fun (21 September 1887: 128. Courtesy of the Suzy Covey Comic Book Collection in the George A. Smathers Libraries, University of Florida. Click on image to enlarge it. This kind of class-based humor in which the cartoonist mocks a character’s ignorance of words or phrases appears more commonly in cartoons making fun of country people, particularly those in Ireland. 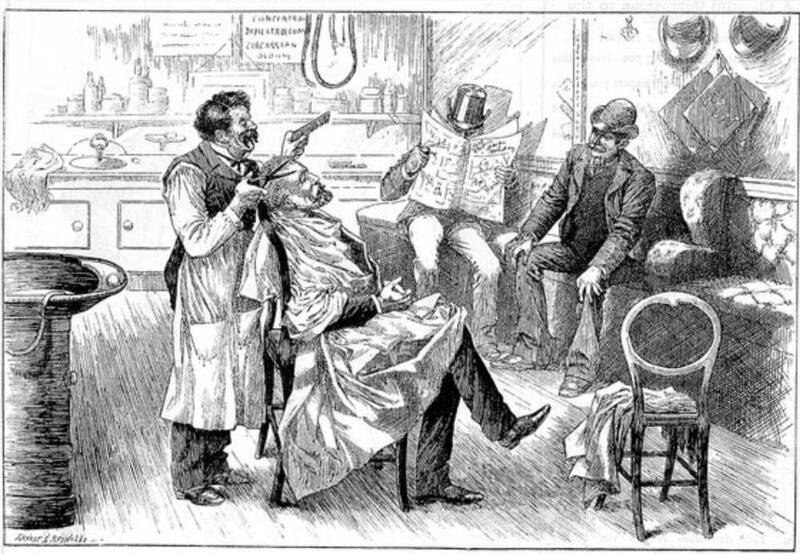 Another point one might about this cartoon as about many others in Punch, Fun, and similar magazines is that the artist has created a detailed genre scene, something that mighty serve as subject for a painting, just to make a play on words in the service of a little social satire. Unlike most twentieth-and twenty-first-century cartoons, which derive from caricature, this and others like it are visually identical to book illustration. This periodical also frequently carried emphasizing the horrors of poverty and starvation and the difficult life of street sweepers and workers.